1. What is involved in moving your home with WH Cox & Son? We have been proudly offering home removal services to the Surrey, Middlesex, Sussex & South-West London areas for many years. 3. Do you offer van hire service only? No, we only use our vehicles for our own removals and do not hire them out. 4. Do you offer unloading services only? No, we only provide a full removal service. 5. Can you help us move part of our home to another location? Yes. We follow the same process for all our moves. 6. We currently have some furniture in another storage facility, can you pack our home & then collect our stored furniture on the same day to move to our new home? Yes. Depending on the location of the storage facility. 7. Can customers ride with the drivers if necessary? Only in exceptional circumstances can customers ride in the cab, we prefer not to allow this. 8. How many moves do you complete each day? 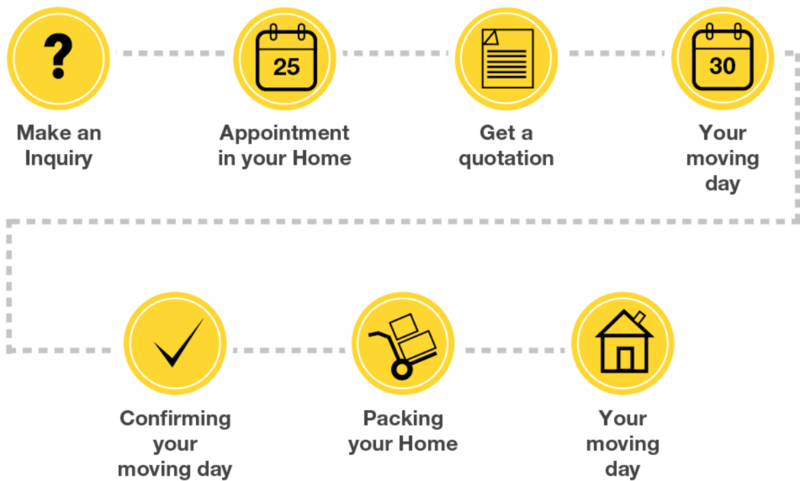 We can currently undertake up to 6 household moves a day. 9. For enquiries through the contact form, what is the expected turnaround times for a response? 10. What makes a move go smoothly? Preparing for your move in the weeks prior will ensure you are ready to go on the day. 11. How much will it cost to move house? We will organise to attend your home and provide a next day quotation for your move once you have made an enquiry with us. 12. Can you help if we move on a weekend? Yes. We can help you move on Saturday and Sunday. 13. How long does it take to move? We can give you more accurate timeframe with our quotation. We complete each move within the day. 14. What time do you turn up? Depending on your location, our team turn up between 8 and 9am. 15. What if it’s raining on the day? The team will cover carpets with blankets and can use a plastic protector if requested. Unfortunately they are unable to take their shoes off for health and safety reasons. In heavy rain, furniture is also covered between the house and vehicle. 16. What happens if I don’t get the keys to the new house on time? We can offer storage services when there has been a delay to your move. 17. What packing services do you provide? We can provide any packing that you require, usually we price for china and glassware only or for all packing. Another popular option is for the entire kitchen to be packed by us. 18. Do I need to pack hanging clothes? No, if you are taking your wardrobes with you or you have wardrobes in your new property the team will use rails on the vehicles, otherwise we can provide wardrobe cartons (tall cardboard boxes with a rail). 19. Do chest of drawers need to be packed? Chest of drawers can remain with clothes in them, just ensure that there is nothing breakable or too heavy in them. 20. How can I take precautions with my antiques while moving homes? The WH Cox Team will wrap these for you to ensure they are safely moved. 21. What do we do with TVs that don’t fit into boxes? The removal team will wrap these in woollen blankets on the vehicle and they are usually placed under a table or similar items to protect them from any damage. 22. What items must not be packed when moving homes? Anything that can be packed, should be packed and secured in boxes. 23. Do you have insurance? We have insurance cover for the transport and unloading of your items. If we are packing your belongings, this is also covered. Our vehicles and Staff are also fully covered, and we have separate insurance for our storage services. 24. How much insurance do you have? We automatically cover all removals up to the value of £50,000 free of charge, if higher cover is required we can increase this at a small charge. Storage is covered separately up to the value of £5,000 per container used. 25. What happens if there is a breakage? Should anything be damaged during these processes, the insurance cover would apply. Its very rare we break anything. We are extremely careful, in the event of damage we will deal with any claims professionally and amicably. 26. Is there anything I am not covered for? Contents of boxes if packed by owner are not covered under our insurance, however they are covered if packed by us. 27. What will I fit into one storage container? Our storage is charged per container used, each container is 7x5x7ft high (as a guide each can usually hold an average bedroom contents). 28. What are the minimum/maximum storage durations? What are cost based on? Storage duration has no limits, some people do stay in overnight, others have been storing with us for 10+ years from when we obtained the warehouse; storage is charged by the week and invoiced quarterly. In the case of an overnight storage, we would not charge for this although is not very cost effective if only for cleaning purposes as it ties the vehicle and men up for a second day, therefore removal charges apply.